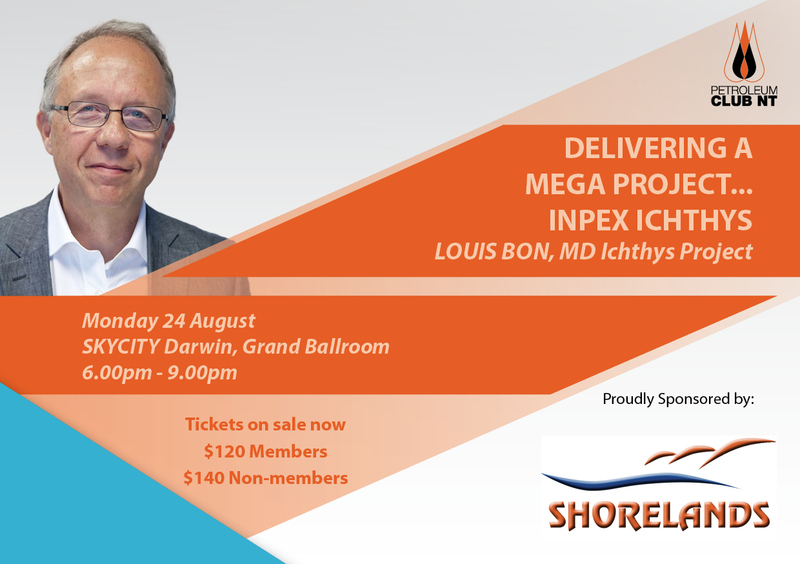 PCNT welcomes Louis Bon, Managing Director INPEX Ichthys Project, as guest speaker at our first networking dinner in August. As Australia moves to take its place as one of the world’s biggest LNG exporters by 2020, the Ichthys LNG Project stands as one of the country’s most exciting and challenging developments. Operated by INPEX in joint venture with major partner Total, CPC Corporation Taiwan and the Australian subsidiaries of Tokyo Gas, Osaka Gas, Chubu Electric Power and Toho Gas, the Ichthys LNG Project has captured the imagination of the oil and gas industry with some of the world’s biggest and most advanced offshore facilities, massive onshore processing infrastructure near Darwin in the Northern Territory and - uniting them - an 889 kilometre pipeline. Mr Bon will provide an overview of the Project, highlighting that it is one of the few – if not only – mega subsea projects worldwide that incorporates the whole chain of development and production components - subsea, offshore, pipeline and onshore. Tickets include 2 course meal; beer, wine and non alcoholic beverages. This event is proudly sponsored by Shorelands.